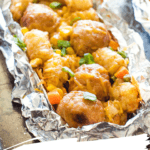 Delicious Meatball Foil Packet Meals are so easy to make in the oven, over a campfire or on a grill! 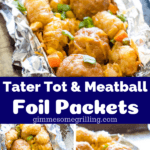 These Tater Tot Meatball Foil Packets are an entire meal! 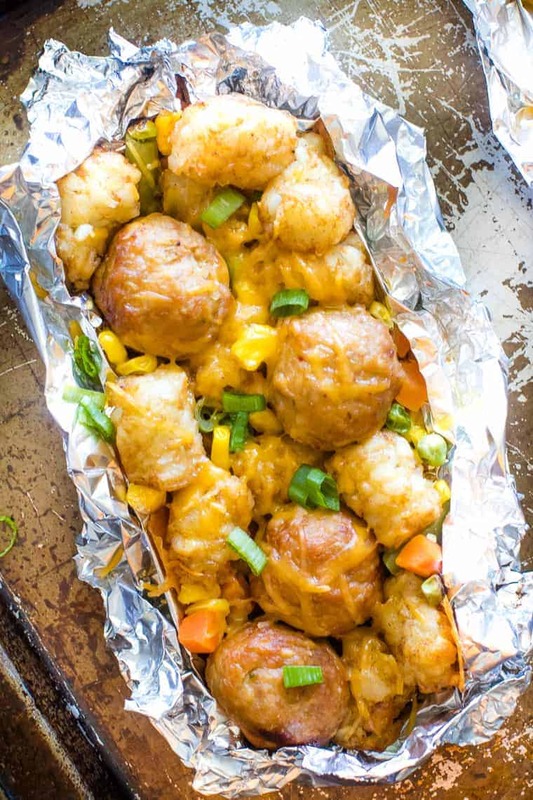 They have juicy meatballs, crisp tater tots, vegetables and of course cheese for an entire meal in a foil packet! Now I know you’re going to fall in love with this one! Foil Packet Meals on the grill are delicious! Like my recipes for Sausage and Vegetable Foil Packets and Cheeseburger Hobo Packets. 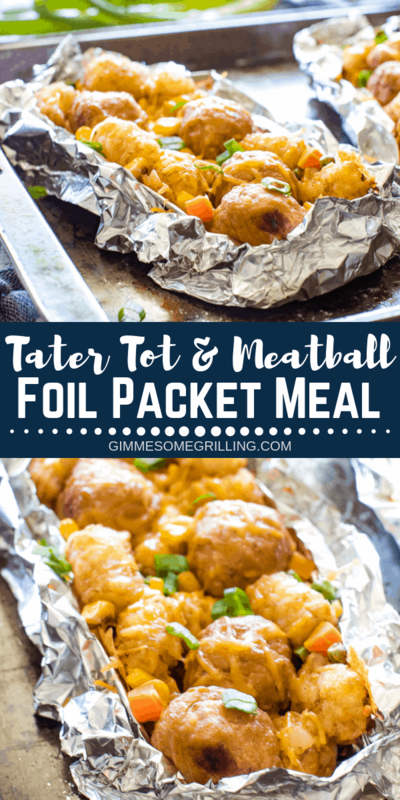 This time I went for a totally kid friendly option with these Meatball Foil Packet Meals! They have Tater Tots so it’s automatically a win, plus I snuck in some vegetables so Mom feels like she’s winning too! 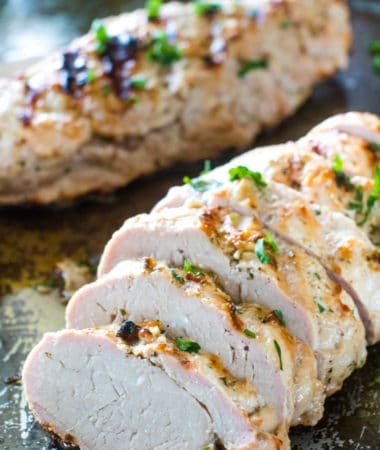 You can even prep these and freeze them right in the foil so you are ahead of the game if you like to do freezer meals! Breakfast and dessert in a foilpacket? Yes, we can do that too Cinnamon Monkey Bread and Campfire Apple Crisp Foil Packets. I’m telling you…. foil packets are the way to go! Why? Meals are already portioned out. They are easy to cook, taste delicious and clean-up is a snap! Yup! Totally my kinda meal! I’m a firm believer tater tots make the world go round. The kids love them! They will clean their plate (or packet in this case)! Which makes my life a ton easier! And shhh…. don’t tell…. I even sneak some veggies in there! Rock Star Mom!! How long do you cook foil packets on the grill? 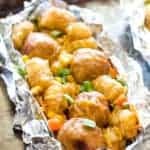 The packets will be placed directly on the grill and cooked for 30 minutes until the meatballs are hot and steaming and tater tots are golden crispy brown! Can you freeze foil packet meals? 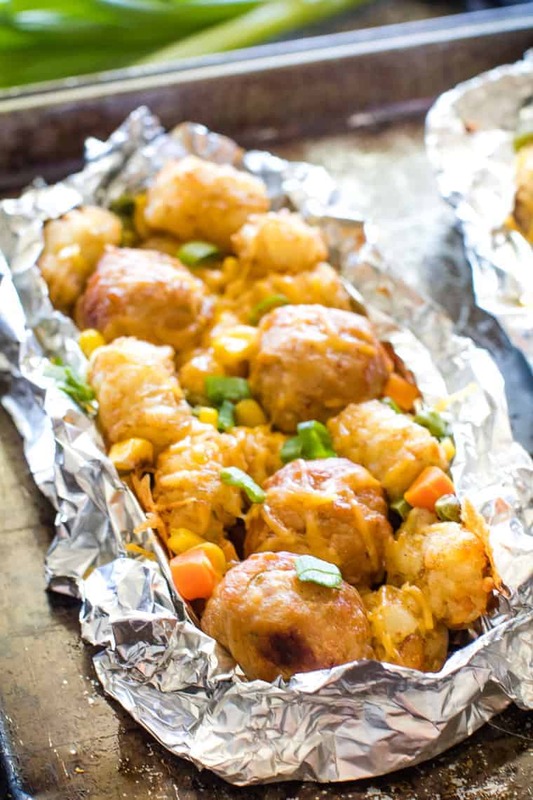 Actually you can, portion the meatballs, tater tots and veggies between the different sheets of foil. Add the seasoning salt. Seal well and tuck them into the freezer. Open and sprinkle on the cheese before tucking them on the grill. Preheat the grill 350 degrees or prepare your campfire. In a bowl mix together all ingredients. Divide the mixture between the foil sheets. Fold each piece of foil up into a packet and seal. Set the packets directly on the grill and cook for 30 minutes. More great foil meals? Here are some delicious options! What’s your favorite meal in a packet? Comment below and let me know! Love to have a five star rating on this recipe after you’ve given it a try. 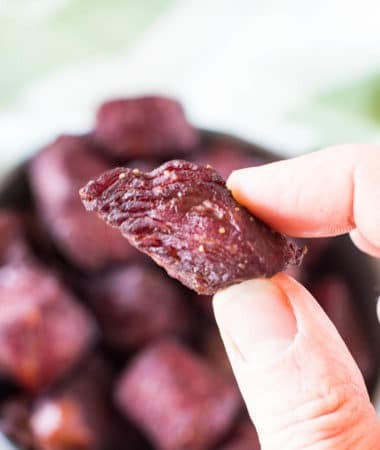 It’s super yummy, you’ll love it! 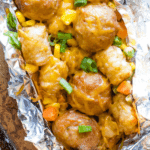 Delicious Foil Packet Meals are so easy to make in the oven, over a campfire or on a grill! 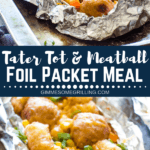 These Tater Tot Meatball Foil Packets are an entire meal! 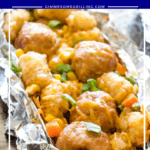 They have juicy meatballs, crisp tater tots, vegetables and of course cheese for an entire meal in a foil packet! Preheat grill or oven to 350 degrees or prepare campfire. Measure out eight 8'' x 12'' pieces of heavy duty aluminum foil and spray with nonstick spray. Divide the mixture between the eight foil sheets. 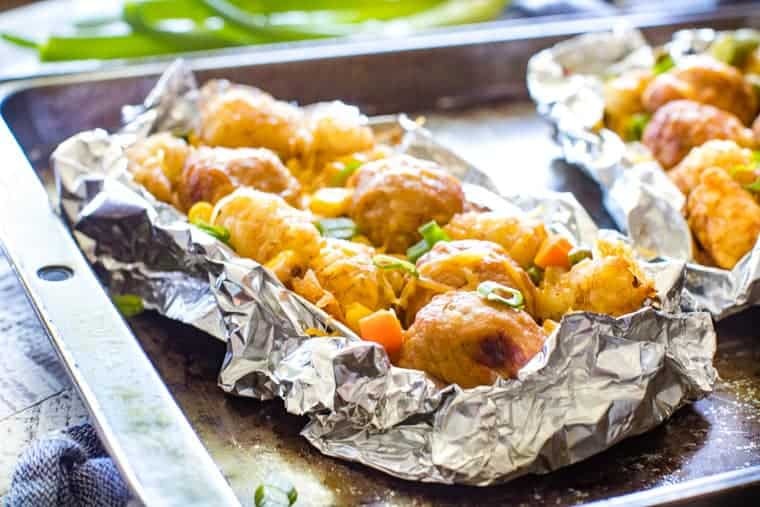 Fold each piece of foil up into a pack. Fold two opposing sides together and then crimp the edges closed. Double wrap if you don't have heavy duty aluminum foil. Set the packets directly on the grill or in the oven on a sheet pan and cook for 30 minutes or until everything is warmed through. You can also cook these over your campfire on a grate. Serve immediately. This is a recipe I have not seen or thought of and looks like the perfect “individual” family meal! Yum! Comfort food made on the grill?? SIGN ME UP!! Right?! Comfort food for the win! This would be the best camping food ever! I totally want to try this! 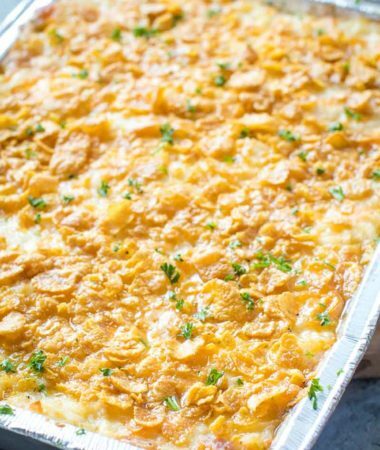 This is recipe is perfect for camping for sitting around the backyard bonfire! So much fun!! Such a fun idea and so delicious! I can never say no to it! This was great for meal planning! I made them up and froze half and the frozen ones came out great!